Right after the GA there was no time for me to relax. The LinuxTag 2009 in Berlin started right after it. As every year FSFE was present with an own booth and answered many questions by interested visitors. Some people even became Fellows right at the booth and some that were already fellows expressed their desire to organize fellowship meetings in their home town. 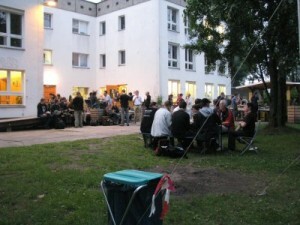 The LinuxTag lasted four days and after every day was over there were tons of social events. The picture on the right shows the BBQ of Linux Works that was quite some fun. More LinuxTag coverage is available at Matthias’ and Edgar’s blog. Like any other event, the LinuxTag had to end as well. What was left for us was to pack our booth and carry it through Berlin. This was quite exhausting but also fun. See you next year! that will give FSFE a new face. Christian Holz as Executive Director. coordinator. He will also work as the coordinator of the German team. bring FSFE and Free Software forward a great deal. In my opinion, the entire GA weekend was awesome and a great experience. if the executive team does and will do its job properly. taking and to make sure that its resources are put to the best possible use. There is also a press release introducing the new team.